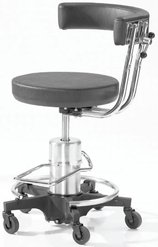 See below for a complete selection of foot-activated hydraulic and pneumatic stools. with quick delivery to your facility! This new stylish design adds to the appearance of your surgery suite. 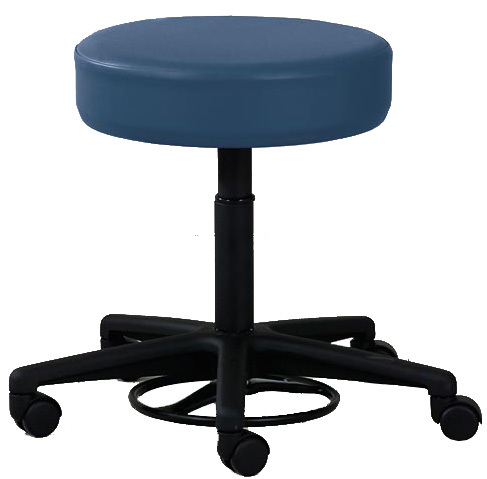 A 3" thick, 16" diameter round seat with high density foam that provides a comfortable place for your surgeon to sit and work. 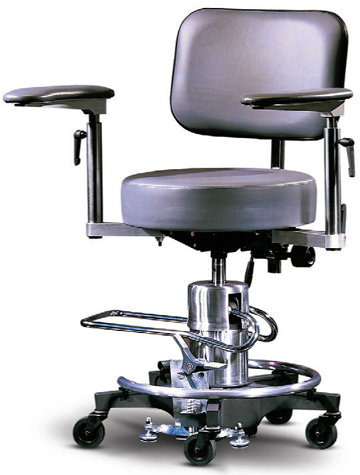 Hands-free seat height range of 22" to 28½" results in a convenient working height range for your surgeon. Note: This is a good working height for 90% of surgeons. 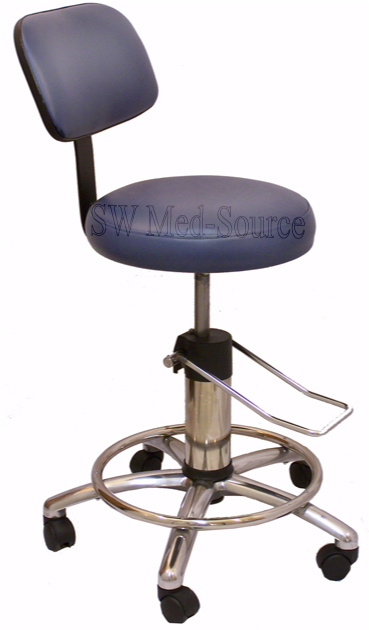 An estimated 50% price savings over similar hydraulic surgeons stools. Quick delivery within 3 weeks, not 6 or 8 weeks! Heavy-duty 3½" thick hydraulic pump with a seat rotation brake that locks when foot pedal is lifted with the heel of your shoe. A stainless steel foot ring that is bolted, not clipped to the frame. Durable ½" solid steel chrome foot pedal. Stable, non-epoxy brushed aluminum base that is easy to clean. A stylish design adds to the appearance of your surgery suite. 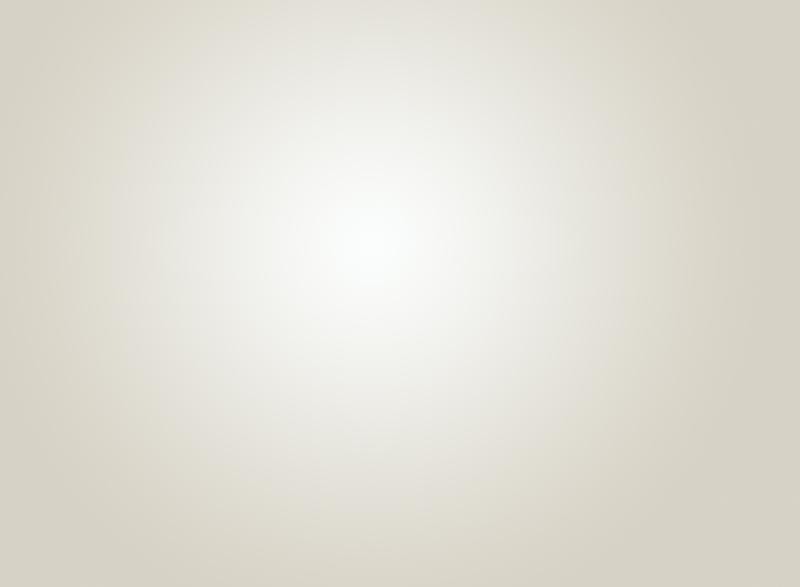 Available in 18 attractive vinyl color choices. Dual polyurethane wheel casters are both attractive and durable. Available with optional set of two convenient locking casters that lock when the seat is occupied. Warranty: 1 year. Weight capacity for this particular stool is 400 lbs. when evenly distributed. Note: Like all the stools shown on this page, this foot ring was designed as a foot rest, not a foot stand. round seat with high density foam. base for very tight spaces. 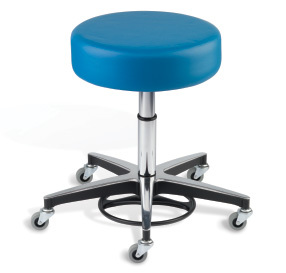 A 2" thick, 15" diameter round seat with high density foam that provides a comfortable place for your surgeon to sit and work. STANDARD seat height spans from 17" to 25" above the floor. MEDIUM seat height, for surgical use, spans from 20½" to 28". 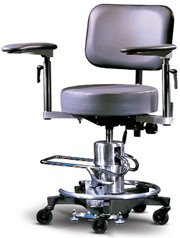 HIGH seat height, for surgical use, spans from 24" to 31½". Average delivery time: Approx. 6 to 8 weeks. Mobility is provided by rugged two-and-a-half inch casters molded from hard rubber. Base casting and legs are finished in tough, black epoxy enamel. All exposed metal, with the exception of the aluminum base casting, is chrome-plated steel. Swivel of stool seat may be locked by lifting foot pedal. Match your O.R. suite decor with a selection of 14 easy-to-maintain vinyl colors. Manufacturers parts warranty is one year. Note: Warranty card must be completed and returned to manufacturer within 2 weeks from installation date. Dimensions & Specifications: Base diameter: 19¾". Footrest: 16" in diameter. Two-inch spacers are available to elevate the ring two to four inches. Shipping wt: (47 lbs) These stools are tested for a 400 lb. weight capacity. For optional #09379 floor locks, please add $200 to your cost. quick delivery to your facility! An adjustable, tilting, upholstered backrest.with horizontal and vertical adjustments and a tilt feature that adapts to the individual requirements of every practitioner. seat with high density foam. a comfortable place for your surgeon to sit and work. Actual seat measurements: 16" wide in the front; 14" wide in the back x 14" deep. The Reliance Model 556 features an upholstered three-way, wrap-around-arm for abdominal, back or arm support. Dimensions & Specifications: Base diameter: 19¾". Footrest: 16" in diameter. Two-inch spacers are available to elevate the ring two to four inches.Shipping wt: (47 lbs) These stools are tested for a 400 lb. weight capacity. 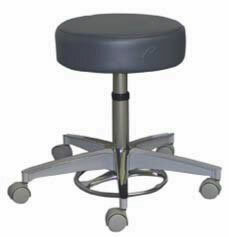 The Reliance Model 558 Stool was created to provide optimal stability, flexibility and comfort for physicians during the most delicate surgical procedures. A foot-activated hydraulic foot pedal enables physicians to position themselves without breaking the sterile field. 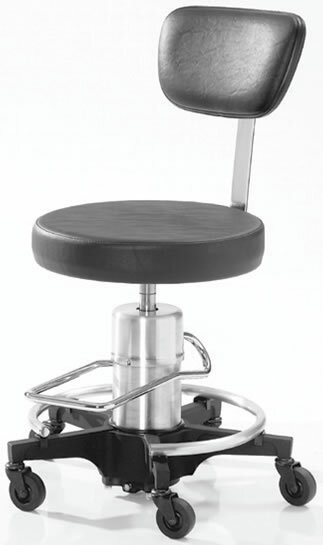 This stool includes specially designed floor locks to prevent chair movement during surgical procedures. In addition, five legs distribute weight evenly and ensure stability. The circumference of the base also exceeds that of the seat to further maintain stability, even in the elevated sit-stand position. The Model 558 was designed to provide maximum comfort and support for the practitioner's back, arms and wrists. Upholstered armrests support the practitioner's forearms. For comfort, they adjust vertically and lock in place. For convenience, the angle of the arms can be adjusted and locked into place, then rotated freely to the rear upon completion of the procedure. The ergonomic upholstered backrest adjusts vertically, tilts forward and locks in place. STANDARD seat height spans from 21" to 28½". MEDIUM seat height, for surgical use, spans from 24" to 31½". 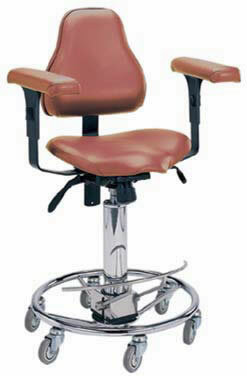 HIGH seat height, for surgical use, spans from 27" to 34". Pedigo model P-7000 was designed for ENT and Reconstructive procedures. This stool has a single pedal height adjustment of 22" - 29½". It includes a sensaform body contoured seat and back. Height adjustable/ articulating arm/ wrist rests. Chrome-plated, 6 caster base with high grade 3" casters. #72 optional locking casters (2 ea.) on opposite sides are $44. Available in a variety of vinyl colors. 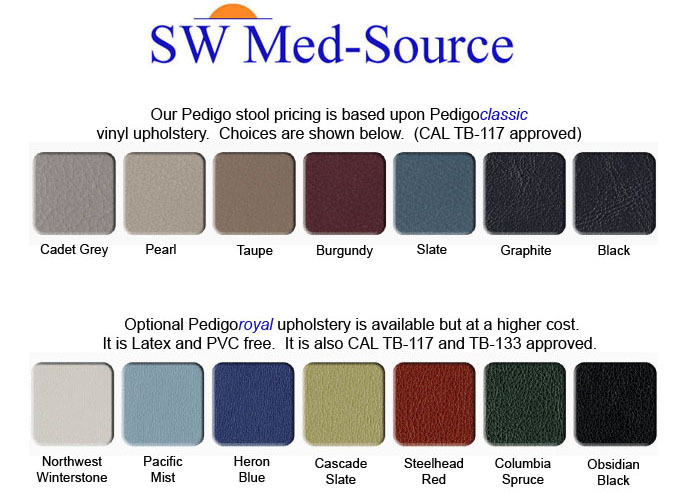 Pricing is based upon the Pedigo Classic vinyl colors. Dimensions: Seat is 19"w x 17¾"d. Back is approximately 14"w x 14"h.
Pedigo model P-6000 features a single pedal height adjustment of 22" - 29½". 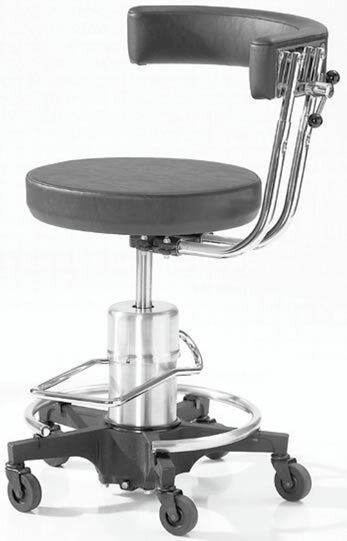 It includes a 16" diameter seat, a small size backrest and a powder coated 5 caster base with 3" locking casters. Optional armrests and locking casters are available. #72 (two) optional locking casters on opposite sides are $44. Available in a variety of vinyl colors. Pricing is based upon the Pedigo Classic vinyl colors.. Delivery: Approximately 2 - 3 weeks. Manufacturers warranty is one year. Pedigo model P-6000 with P-6000-PR curved procedure rest provides unmatched support versatility. It can be used for abdominal support or as a wrist rest, elbow rest or back rest. The procedure rest rotates a full 360 degrees. 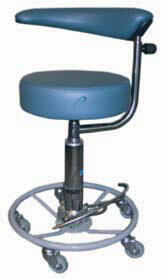 This stool also includes a special density foam which provides comfort and support for those long procedures. Seat height range of 22" - 29½". Weight capacity: 300 lbs. Delivery: Approximately 2 - 3 weeks. What's the difference between hydraulic and foot-activated pneumatic stools? 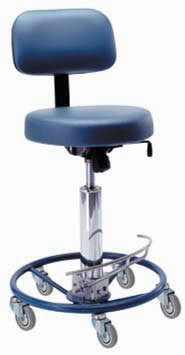 The hydraulic surgical stools shown above elevate when you pump the lever with your foot. The seat then lowers when you press all the way down on the foot-activated lever. You can remain seated while raising and lowering the seat. 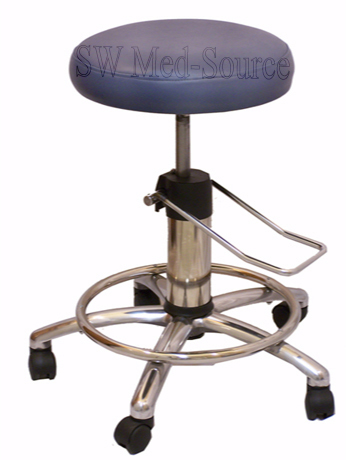 These stools are often used as ENT stools, ophthalmic stools and ophthalmology stools. When your surgeon asks for a hands free surgical stool, this is the stool they usually want. The foot-activated pneumatic stools shown below will raise and lower when you press down on the ring with your foot. But you must lift your buttocks off the seat while depressing the footring if you want the seat to go up. They are not as convenient but they are less expensive. Which one is best for you? Obviously it's up to the surgeon, the application and your budget. That's why we offer both. Note: Beware of misleading advertising. 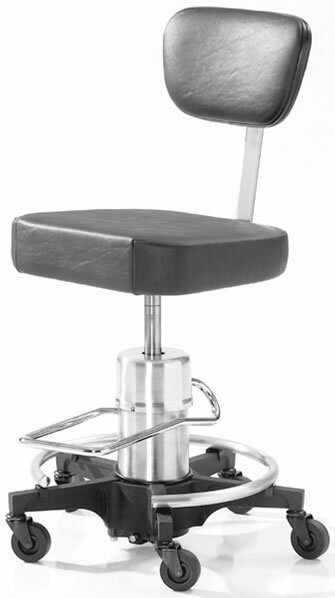 Some companies classify their stools as hydraulic when they are really foot-activated pneumatic stools. There is a difference! Recessed foot-activated ring reduces the risk of accidental lowering while the surgeon is operating. Outer footring provides a safe, convenient place for the surgeon to rest his/ her feet while operating. Also when the surgeon sits down, the stool is mobile. When the surgeon stands up, the casters lock. This reduces the risk of the surgeon falling in case they decide to sit back down. This stool weighs just 32 lbs. and is easy to move. These unique features makes this a "surgeons preference" product. Heavy steel chromium-plated base provides great stability. Hands-free seat height adjustment of 21½" to 32". 14" diameter fully padded seat with Black Naugahyde vinyl upholstery. Used at some of the most prestigious medical facilities. It's unique and imported from Germany. A higher cost is the result. FOB Factory. Freight is pre-paid and added to invoice. This stool weighs about 34 lbs. and is easy to move. 14½" diameter fully padded seat. Seat is thick and very comfortable. 23" diameter 5 caster polished aluminum base. Hands free seat height adjustment of 19¼" - 24¼". Pricing is based upon the Pedigo Classic vinyl colors. Weight capacity: 300 lbs. Manufacturers warranty is one year. Features a higher hands free seat height adjustment: 22" - 29". Includes a comfortable 16" diameter fully padded 3½" thick seat. Also includes a 23" diameter 5 caster cast aluminum base with dual-wheel casters dsigned for hard floors. Optional #VF Vacuum-formed upholstery is also available for the same price. This upholstery prevents bacterial and fluid infiltration. But it's only available in Slate Blue and Black. 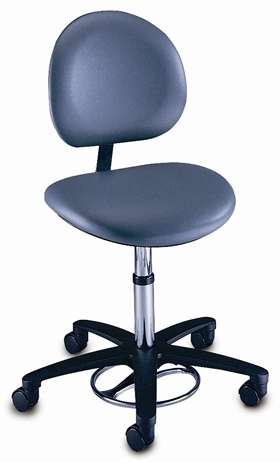 Also available with optional #LRO locking casters that resist movement when seat is occupied. Add $46 to cost. Please note: A lower seat height range of 18" - 23" is also available. Use stock # 2A10-C-CRC. The price is $365. Manufacturer's warranty is 13 years on the frame and pneumatics. Contemporary styling, available in a variety of vinyl colors. Seat height range of 19½" - 24½". Soft-feel 4" thick, 16" diameter seat with polyfoam padding. Premium stain resistant, woven, knit-back vinyl upholstery. 5 leg, 23" diameter black powder coated aluminum base. Soft-roll, dual wheel hooded casters. Hands free, foot operated height control. Pneumatic height adjustment of 19" - 24". 23" Powder coat black aluminum base. High impact black plastic backrest shroud. Backrest is adjustable in and out. However there is no seat or backrest tilt control on this model. Seamless upholstery is standard on this model. Note: Also available without backrest. Includes 16" round seat. (#21340) Normally $404. Your cost: $384. Also available w/ #03335 locking casters. Add $79 per set of 5 casters to cost. Seat height range of 18" - 23". 14" diameter seat. 24" diameter aluminum base. 19" to 25½" height adjustment. 2" dual-wheel casters. 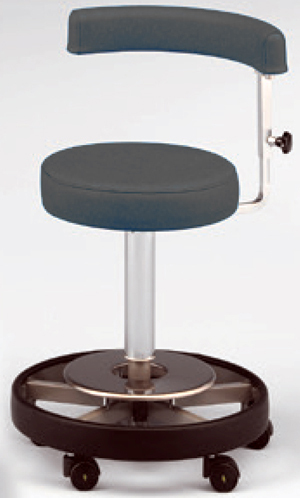 Please note: Above stools are custom, made to order with your color upholstery and are non-returnable.